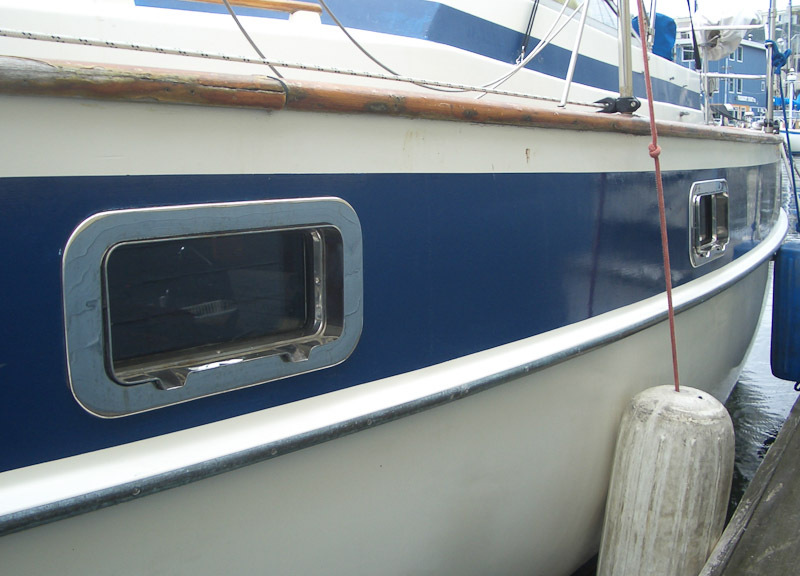 I have done a lot of work on our boat since purchasing her, however perhaps the most interesting upgrade to others might be the replacement portlights I got from New Found Metals. 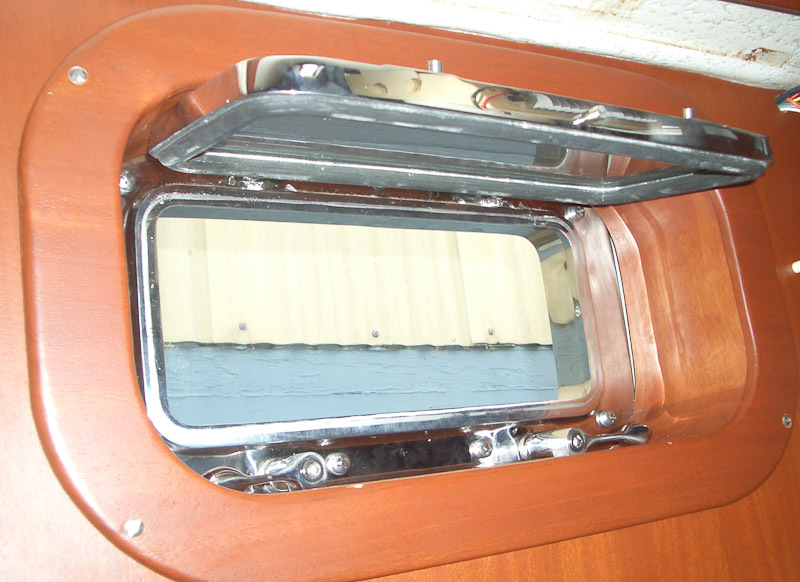 The portlights on the older Enderlein-designed Hallberg Rassys were placed in the hull rather than the cabin top. These portlights had an aluminum exterior frame, a lexan window, and knurled plastic nobs that one screwed down to secure the window. 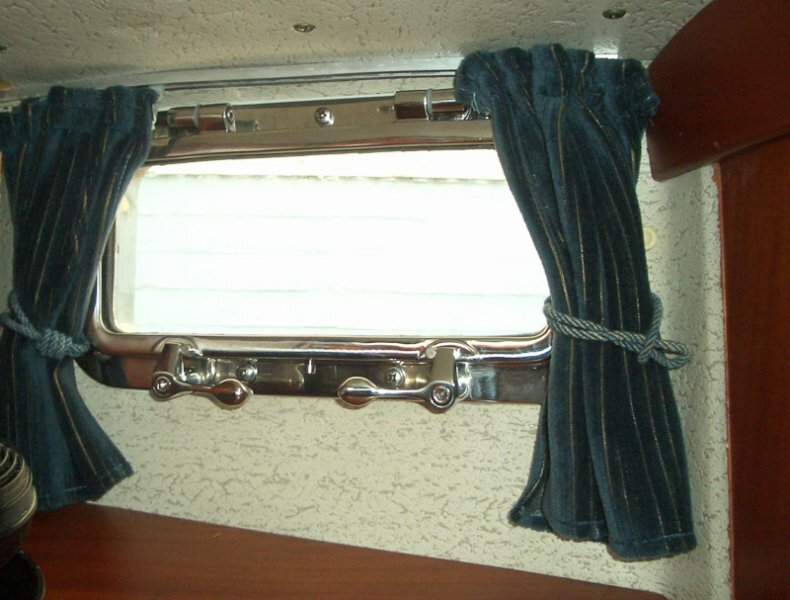 The hinges at the top were plastic and were ridged so as to hold the window up and open when desired. Over time they have not held up well. The aluminum has pitted, the lexan is crazed, and the plastic hinges have become brittle - a potentially dangerous situation in rough weather. A view of the original portlight from the outside. Note the corroded aluminum frame and crazed Plexiglas window. A view of the original portlight from the inside. Note the dogs (to hold the window shut) and the plastic hinges on the top. The same portlight was used on the Norseman 447. Their user group originally contacted NFM and asked them about a custom-made replacement. When I talked with NFM at the Seattle 2010 boatshow in January, they told me about the new portlights made for the Norseman group. I ordered 1 to try the install first before committing to all 8. In short they fit perfectly and I ordered the remaining 7. My new ports are solid, safe, clear to look through, and have a large, non-leaking gasket. A view of what each kit contains - trim ring, spigot with window, butyl, and the drill guide. What follows are some install instructions from having put half the ports in. The first took me two days, the second, a half day, the third, 6 hours, and the most recent one, about 2-3 hours. It's actually an easy job once you learn some tricks. 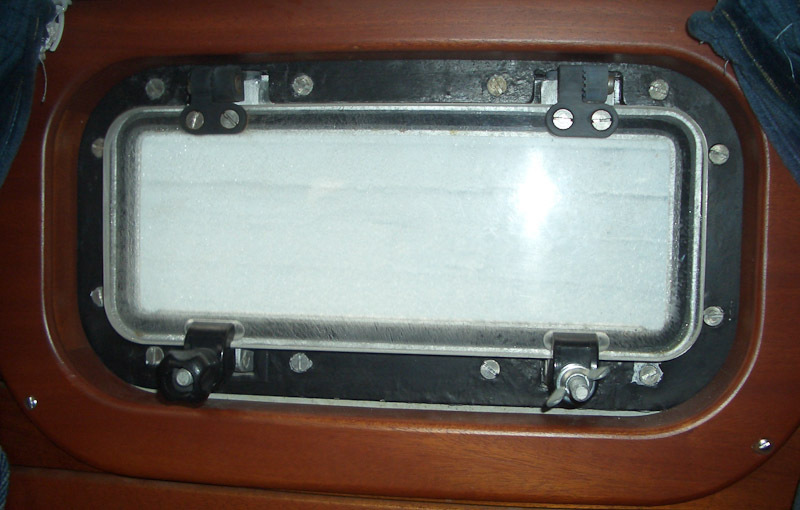 A view of the original portlight inside the head with the trim ring removed. Now, getting the exterior frame off is easy. Just put a chisel carefully between the hull and the frame on the exterior and give a few taps from a rubber mallet. The frame was glued to the hull with butyl tape which on my boat was still pliable and sticky after 27 years. 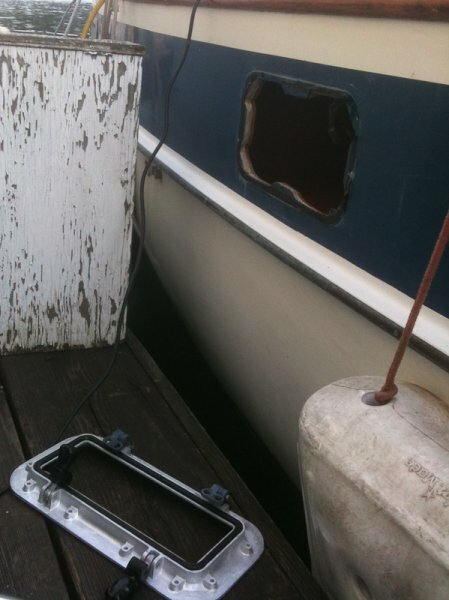 Once you have a corner up, you can just pull the frame off the hull. On the Norseman appearantly they bedded the frames in 5200. Their removal process is much more involved. The original frame has been removed and you can see the raw hole in the hull. The next step can take a while if you are not slow and methodical. The opening once you remove the old portlight is plenty big enough for the new one but you need to grind out openings for the raised areas on the trim ring that receive the screws. The best method I have found to do this is to use the packing cardboard for the trim ring from the box, enlarge the holes so they are clean, and use the cardboard as a template to mark where you need to grind. You will want to take your time and ensure everything is lined up properly. The very top hole will be able to be drilled with a drill. The rest of the holes are half through the hull and half through the opening so there is no way to drill the hole. A small handsaw then cleanup with a dremel works properly here. You will want to make the openings fairly large so you have some ability to shift the trim ring around. 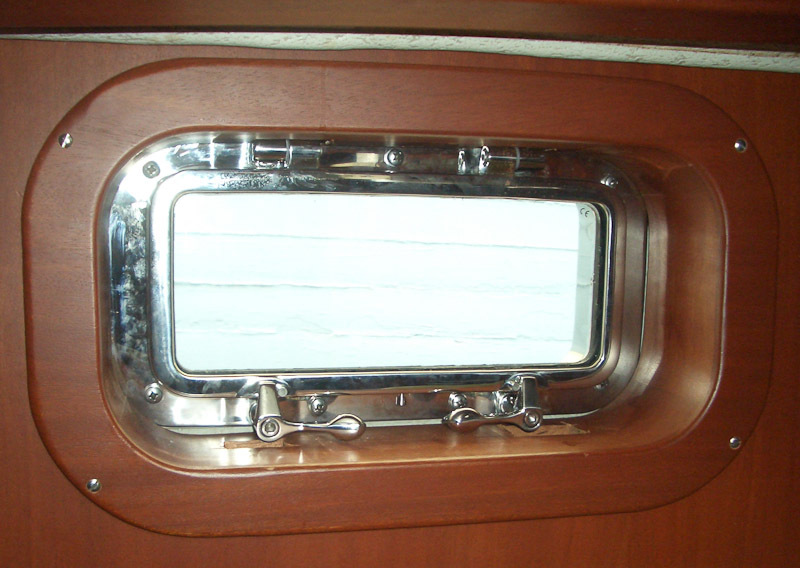 Below is a photo of the portlight dry-fit into the opening. You can see where some of the screw holes just meet up with the hull. By the way, you are going to fill all these openings with butyl. A view from the outside of the new portlight fit into the opening of the old portlight. A view from the inside showing the opening of the old portlight. Before you start squeezing sticky butyl everywhere, you want to make triple sure that everything fits properly. The hulls on my Hallberg Rassy 352 are about 1/2 inch thick. Because the interior piece of the port is the male part, and the exterior is the female, you want to decide how much extra spigot you want sticking out. In my case I wanted only about 1/4 inch. 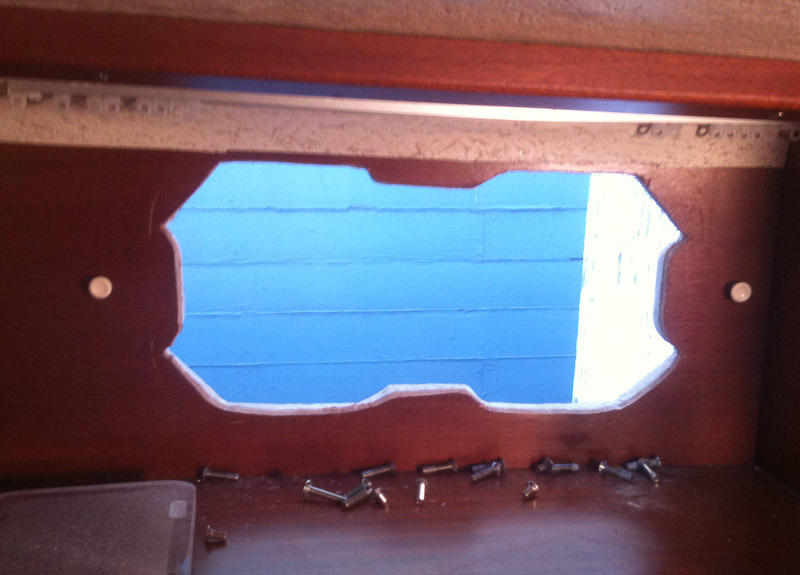 Therefore, I made a spacer out of 1/4 inch marine plywood to take up space between the interior piece and the hull. This has the effect of making the hull thicker and therefore has less spigot sticking out. To make a spacer, you simply trace the outline of the exterior trim ring and cut it out. Be sure to make the opening fairly wide so you can be sure to get it on the spigot. 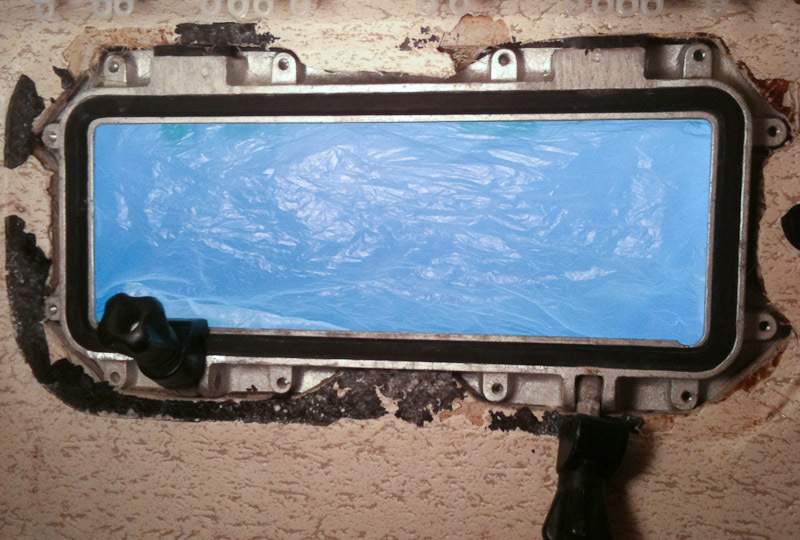 And don't forget to put it on the spigot before laying on the butyl (like I did on one window). The other thing to make sure about are the screws. I found my hull changed thickness slightly from the bow and stern to amidships. So, while I was using 25 mm screws on the portlight in the head, they were too long for the portlight at the nav station. This is another thing to make sure on your dry-fit - too short and you wont be able to get the screws started when you are compressing the butyl. Too long and they will not compress the spigot and trim ring completely. Once you are happy with the fit, clean both the inside of the trim ring and the inside of the spigot with acetone to clean off any oils, etc. that may keep the butyl from sealing. At this point you check one last time and then prepare to load on the butyl. The instructions on the NFM site have you load up the butyl from the inside but I found it best to prop the interior part of the portlight into the opening, secure it with a hand clamp, then start pressing the butyl in. The butyl is like a very sticky black rope. It will get on everything if you are not careful. Your job will be easier if you choose a hot day to do this part as the heat makes the butyl more pliable. Stuff it into all the gaps, but only put on enough to have it just ooze out when you compress the trim ring onto the spigot. How much is that? Very hard to explain. After your first two windows you will know. Most likely you will put on too much on the first one and have it ooze out everywhere, then a bit less on the next one, and finally get it dialed in on your third. One trick I learned was to press the butyl down evenly using the paper the butyl comes packed in. This will make compressing the ring and spigot easier. Some people use polysulfide to seal the outer edge of the trim ring. I decided to use the foam hatch seal that my local boat store had. I like it so much I switched to the stick on weather seal from my hardware store. 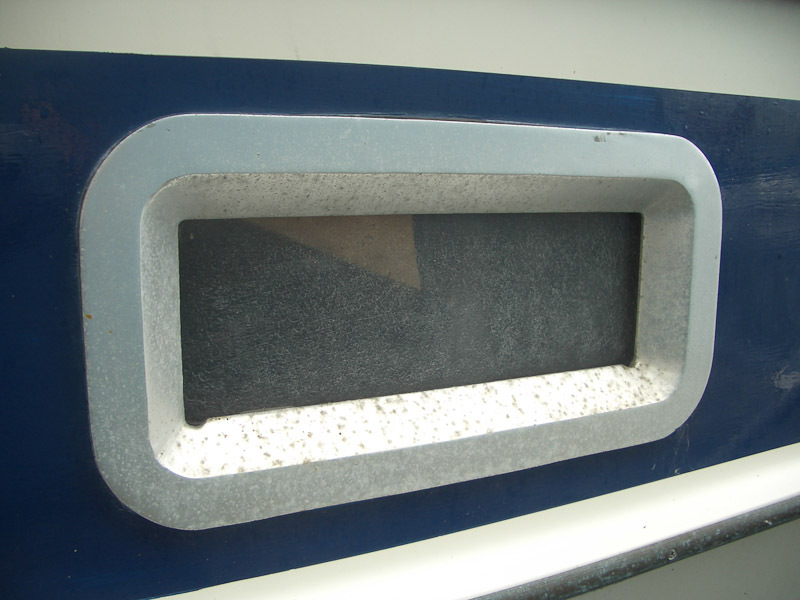 If you have prepared things well, the trim ring compresses tightly to the hull so the foam works well and is clean to work with. Don't forget to add the foam or you will have to try to pull the trim ring from the butyl (like I did) and almost break it because it was stuck so well. This can be the hardest part if you have too much butyl and/or insufficient means for compressing the two. I did my first portlight with two c-clamps that I had to laboriously pad with wood so as not to scratch the new portlight. Eventually I ended up with the clamps you see below. They are easy to work with, have built in padding, and compress nicely. Just don't drop them in the water, as they tend to sink. 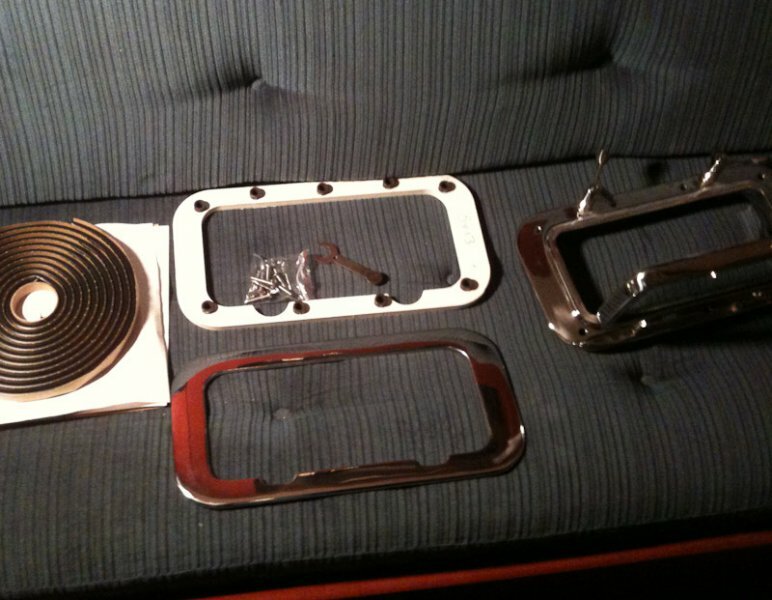 The idea is to press the two pieces of the portlight together enough to get the screws started. Then you can use the screws to compress it the rest of the way. Go slowly as the butyl will need time to ooze out. It will continue to ooze a bit for a few weeks after until the portlight is finally well set. 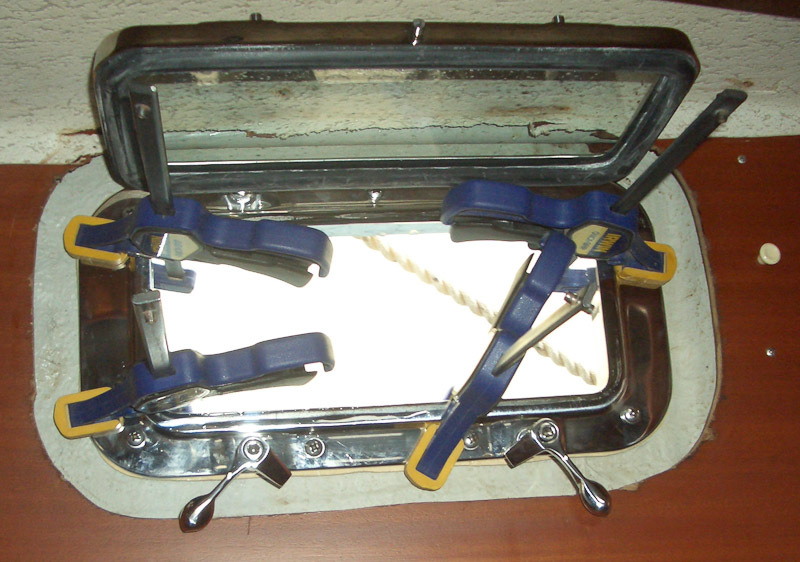 Compressing the butyl between the spigot (interior part of the portlight) and the exterior trim ring using clamps. The butyl will ooze out around the opening between the spigot and the trim ring. This is good because it means the opening is sealed. If there is not any butyl oozing out (like under the areas where the spigot bends to drain water) feel free to add some. The extra stuff that oozed out can be removed easily with a credit card or plastic paint scraper. The trick is to do it kind of fast so as to pull off the extra butyl without pulling out too much. Again, after a few ports you will be an expert. Any little pieces of butyl on the frame or hull are best removed with strong pressure with a clean rag. Acetone does not seem to disolve butyl very well. This is what you were waiting for. Admire the new portlight - how it gleams in the sun from the exterior and looks like original equipment. A shot of the new portlights from the exterior. A closeup of one of the new portlights. A view of the new portlight above the nav station. Note how the trim ring fits perfectly. A view of the same portlight opened. Notice how I had to notch the trim ring to be able to open the handles. 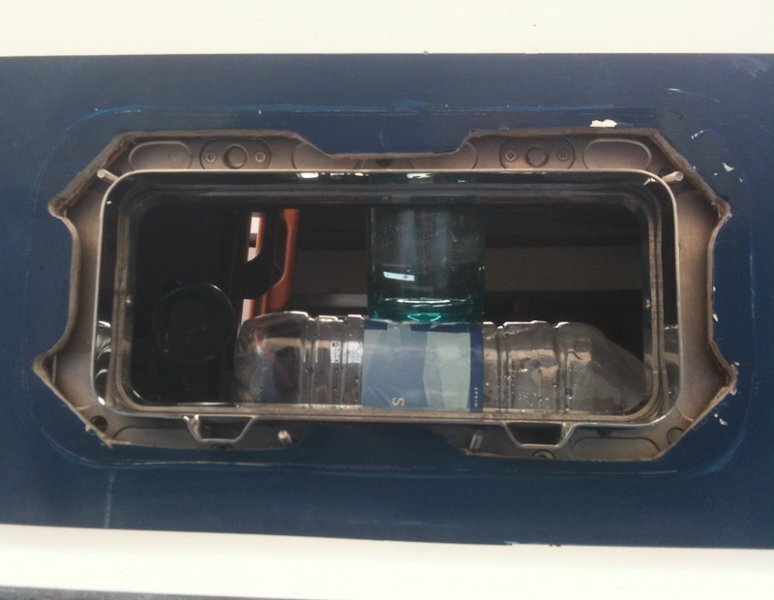 Also notice how the window stays up by itself and the size of the gasket. That's it, you are done with your new portlight. Now, only 7 more to go! Just remember to go over the butyl again in a few weeks. 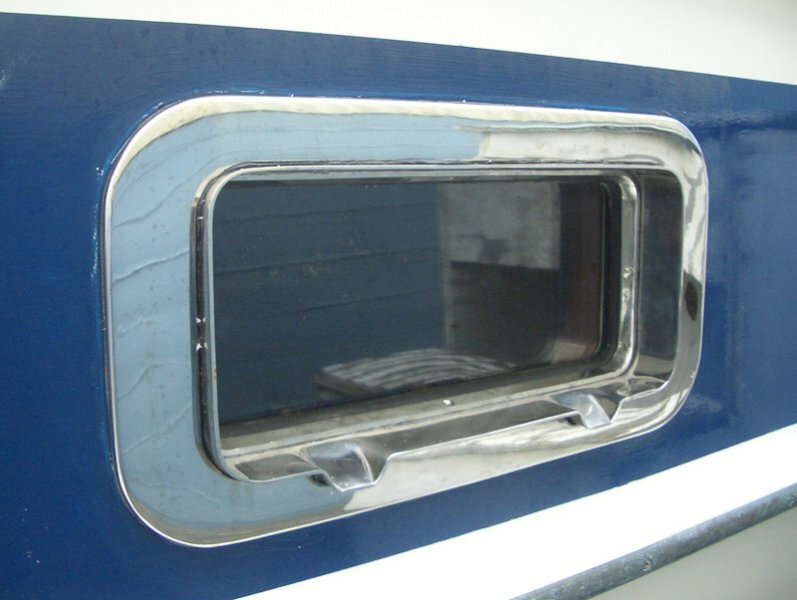 Also, remember stainless can and will rust if left to the elements, so be sure to clean the portlights a few times a year with a good stainless steel cleaner (I like the 3m cleaner). A view of my shiny new portlight in the head.